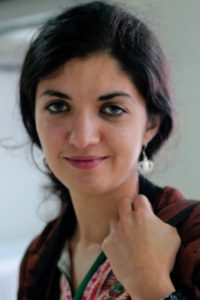 Zarlasht Halaimzai is an Afghan-born British writer and educationalist who arrived in the UK at age 15 after her family was forced to flee Afghanistan. Having experienced conflict and war in childhood, Zarlasht sees education as the best route for peace building, resilience and conflict resolution; she is currently in Lesbos setting up a mobile emotional unit for the refugees there. She has previously worked for Demos, the Young Foundation, The Studio Schools Trust and Future Schools Trust and Save the Children. She is a co-founder of the Skills Lab an education consultancy focused on developing resilience through education. In her spare time Zarlasht is running a grassroots organisation, Support for Refugees in Europe, which provides essential support to refugees in Calais and beyond.